2018 CPSA 11U ALL-STARS ARE STATE CHAMPIONS! Updated Wednesday September 19, 2018 by Gen Info. The Citrus Park 11u All-Stars had a very successful summer! After earning both District and State Championship titles, they participated in the Cal Ripken World Series in Jensen Beach, FL. Their great run ended with a tough 3-2 loss in the semi finals to a solid team from Pennsylvania. Julian Rizzo and Jaden Nazar earned All World Series Team honors and Caden Anderson was awarded a Gold Glove. Julian, Jaden, Richie Ergang, Colin Torgusen and Carson Arnold all received Player of the Game recognition during the course of the tournament. We are proud of the team for their accomplishments but even more impressed with the work ethic and great attitudes they displayed throughout this experience. Thank you to Citrus Park and our team families for your encouragement and support! 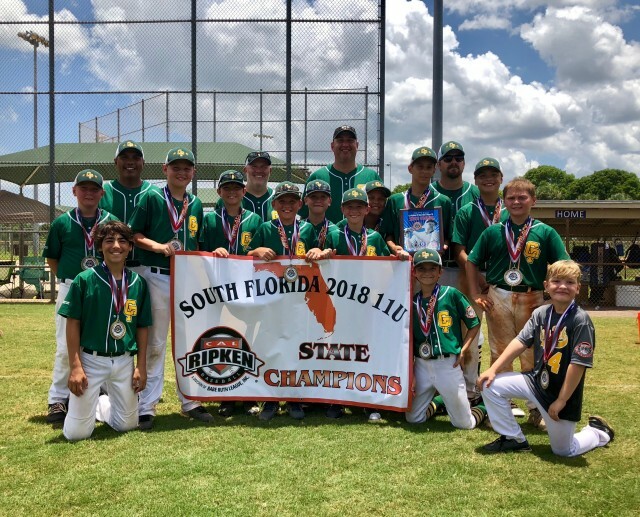 The 2018 11U CPSA All-Star team WON the Cal Ripken Florida State Championship Tournament! With this win, we now move on to the Cal Ripken 11/70 World Series which will be played in Jensen Beach, Florida, August 7-12, 2018! These boys are super excited to be representing Citrus Park Sports Association and the state of Florida, while making memories to last a lifetime!